I’ve been slowly getting back into the swing of astrophotography nightscapes. I wasn’t overly concerned with early milky way season shooting. A lot of it for me is planned and the only really early morning seasonal shoot that I was interested in was washed out due to storm activity. 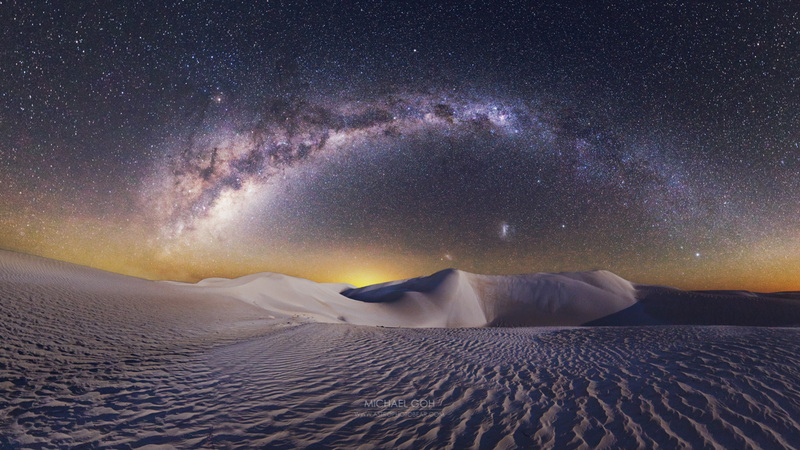 I planned to do a landscape astrophotography trip to some dunes north of Perth (Western Australia). The expected conditions was a setting crescent moon around 30% moon luminosity around the time as the Milky Way was expected to rise. I wanted to capture a time-lapse showing the shadows shifting along the dunes and bringing out their shapes as the moon set. When I prepare for a trip – I usually write down a series of tests and shots that I want to do. I usually don’t get through all of my list, but it helps me stay focused rather than just repeating the same thing. So on this trip, I intended to take advantage of the crescent moon setting. While it was brighter than what I usually want to use (I prefer <20% moon luminosity), I decided that it would be sufficient for my tests. The advantage of the setting crescent moon is that after it’s set, I can image as if it was a new moon. I brought a friend with me on this trip. We did some exploration while it was still light and marked a few locations with my handheld GPS so that we could find them in the dark. I know that I’ve been much more successful with the images when I explore first and can see the landscape. I can use the apps like photopills to assist with the visualisations. Strong winds made it rather uncomfortable with sand getting in the eyes and ears. First location that we marked was for the timelapse. 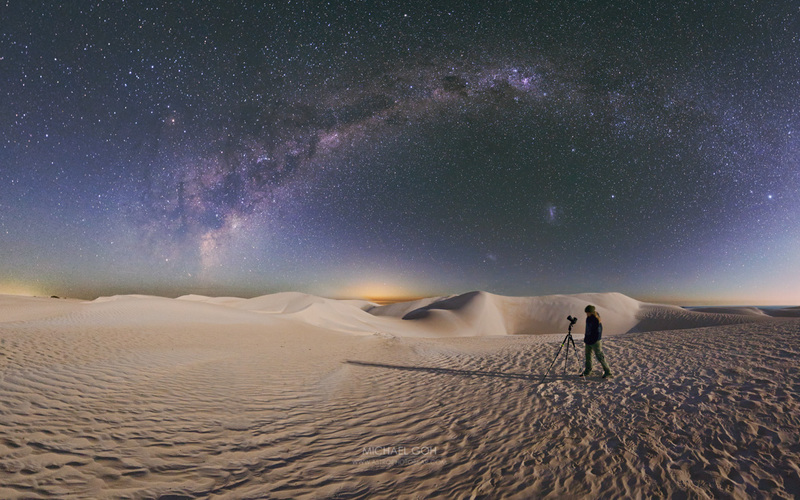 I was happy with the visualisation, the syrp genie mini would pan across the dunes as the moon set. We tagged a couple more locations – one of the locations was accidentally in the field of vision of the timelapse. It’s difficult getting the right conditions at times – having the dunes in the right form and direction for a suitable panorama. Timelapses using setting crescent moon lighting with the syrp genie – lessons learnt about taking a bit more thought into the projected time for the timelapse – so that it would be longer. Extended the time for the panorama to about 51 minutes during a rapidly setting crescent moon. When starting the panorama the sky was still a bit bluish due to the moon being a bit brighter than optimal. Used curves on the rgb channel to do some of the colour balancing – this is a variation to using colour balancing for shadows/mid and highlights. I think this is probably a bit fiddly, while I enjoy experimenting – it’s also about keeping it simple. The advantage of this is I can raise the temperature of the core – and reduce the temperature of the open space using curves – can also be done in lightroom or in photoshop. I may try a bit more experimenting of this in future. What’s next? People who know me I’m pretty busy. I actually photograph a lot more than just astrophotography nightscapes. Anyways – if everything goes according to plan, I’m heading down to the South West coast of Australia very shortly to do a series of more tests, and weather permitting some additional nightscapes there too. I’m doing some more gear testing as well (long overdue). I’ve been working hard on getting a few astrophotography workshops going – I’ve been doing them for years on and off, however I want to structure the content much more.